Traditional domestic hot water storage systems used in the United Kingdom are required to have an open vent pipe, hence the name Vented hot water systems. The vent pipe ran from the hot water storage vessel back to the cistern. The head of pressure created by the Cold Water Storage (CWS) in the loft, means that in most cases the higher the tap or shower the lower the water pressure. Simply, the greater the distance from the Cold Water Storage to the tap or outlet, the greater the pressure. In many properties this is evident with poor showers in the upper floor bathrooms, but good pressure lower down in the property. Because this system is open to the atmosphere the cylinder MUST be located below the level of the Cold Water Storage tank. To overcome this low pressure many people install either whole house pumps or shower pumps, however, with an open vented cylinder, this can draw air into the system – unless fitted correctly – which speeds up corrosion and increases system noise. A traditional vented cylinder can be heated by various heat sources and typically this could be gas, oil, electric only, solar or any combination or the above. 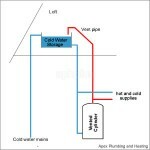 Apex Plumbing and Heating are fully qualified to install and maintain traditional vented hot water systems. In some cases, a traditional vented hot water system maybe more appropriate than an unvented hot water system. Please feel free to contact Apex Plumbing and Heating to discuss you requirements or to arrange an on-site survey.